How will we trade energy in the future? We can expect vast technological changes in our energy systems, leading to high heterogeneity in both supply and demand. Knowing the true value of energy at a given time and location will be crucial. Market mechanisms are methods of determining prices in complex, multi-actor settings. In the Intelligent Systems group at CWI, we have developed a research environment in which different market mechanisms for electricity can be studied and evaluated - in interaction, remotely and in a scalable manner. Claessen, F.N, Höning, N.F, Liefers, B.J, La Poutré, J.A, & Bosman, P.A.N. (2013). 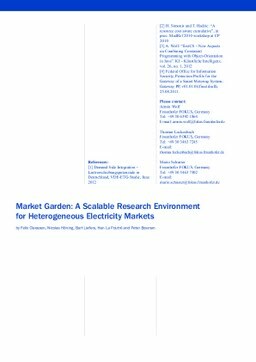 Market Garden: A Scalable Research Environment for Heterogeneous Electricity Markets. ERCIM News, 92, 25–26.